Joe Pinkstone Says Beer To Double In Price Because Of Global Warming! Another Bobby Dazzler from young Joe Pinkstone in the Mail. Funny enough, it appears in the Science and Technology section, although the Children’s page seems more appropriate! Beer-guzzlers worldwide could see their beloved drink skyrocket in price thanks to global warming. Rising temperatures and changing weather patterns are making droughts and heatwaves more common and it is having a devastating impact on barley fields around the world. Barley is a key ingredient in the common tipple and could soon become a rarity thanks to plummeting yields. Experts are now warning that this barley shortage could force the price of a pint to rise by up to double. According to the scientists, the price of a six-pack of beer could go up by an extra £15 ($20) in Ireland. A global temperature rise of of 1.5°C-2.5°C (2.7°F- 4.5°F) is expected to cause a price increase of 10-15 per cent. Under current trends, the world is on course to rise in temperature by 3°C (5.4°F), although the UN-backed Intergovernmental Panel on Climate Change warned last week that limiting warming to under 1.5°C (2.76°F) would avert the worst effects of climate change. 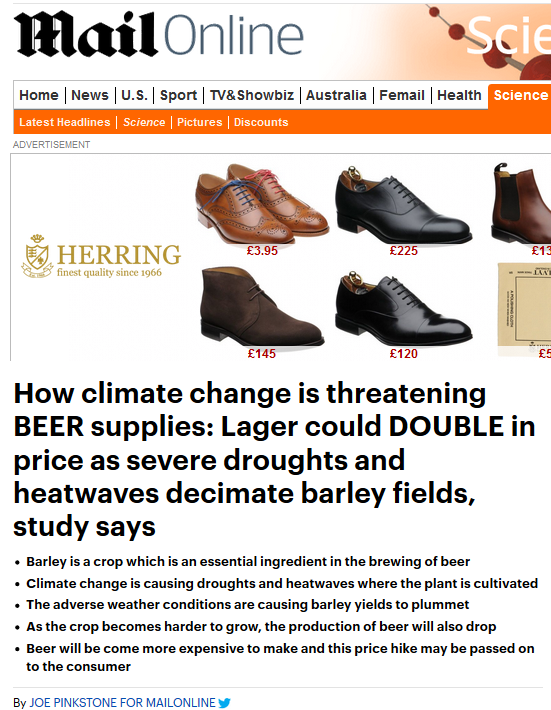 Research co-author Dr Steven Davis, from the University of California at Irvine in the US, said: ‘The world is facing many life-threatening impacts of climate change, so people having to spend a bit more to drink beer may seem trivial by comparison. Only 17 per cent of the barley produced in the world is used in brewing, the authors point out, as most is harvested as feed for livestock. Barley growing regions including the northern Great Plains of the US, the Canadian prairies, Europe, Australia, and the Asian steppe were all likely to experience more frequent droughts in years to come as a result of global warming. Co-author Dr Nathan Mueller, also from the University of California at Irvine, said: ‘Current levels of fossil fuel consumption and CO2 (carbon dioxide) pollution – business as usual – will result in this worst-case scenario, with more weather extremes negatively impacting the world’s beer basket. Droughts and heat waves were expected to cause barley declines of up to 17 per cent in parts of the US, Europe, Australia and Asia where the grain is grown most. In reality, barley yields have been steadily rising while all of this disastrous weather, heatwaves and droughts have been going on. We used to get serious articles on climate change by David Rose. Unfortunately, I hear on the grapevine that he has now been banned writing any more of these. Instead, we have to put up with young Joe, who does not appear to know his right elbow from his left knee, and happily swallows any nonsense he is fed, without even bothering to fact check first. ← Is Wind Power Really “The Cheapest Form Of Producing Electricity Today”, Mr Gummer? There aren’t many journalists left who are prepared to tell the truth: Christopher Booker and James Delingpole; I can’t think of any others. Richard Littlejohn and Quentin Letts, I hope, have a journalistic ‘backstop’ somewhere as, under the new ‘snowflake’ editorship of the the Mail, their days are surely numbered along with Rose. The Telegraph has also gone native, unfortunately. Booker is probably the last man standing in that wearily ‘progressive’ organ these days and he has now been shunted to the footnote pages. A sad state of affairs for the silent majority who cry out for honest, witty and informative reporting. There is also at least one female reporter who tells it as it is as well. David Rose also. But not seen a piece from him of late. Deep in the foothills of Graunaidland, in a woven flax yurt, there must be a group of greenie gurus dreaming up a new catastrophic scenario each day. They then wander proudly out and feed this cr*p to the MSM wet-behind-the-ears “journalists” hanging around outside for ever more ‘evidence’ of AGW to disseminate to a public who are becoming ever more sceptical. There is probably an app for it, their thinking powers probably couldn’t cope. Perhaps young Joe is unaware that the price of 5% beer includes 54p/pint duty. How much Beer Duty you pay depends on the beer’s strength, or ‘alcohol by volume’ (ABV). You buy a pint of 5.0% strength lager. The Beer Duty you pay is 19.08p x 5.0 = 95.40 pence per litre. This works out at just over 54 pence a pint (about 568ml or 0.568 litres). It’s not just tax, the cost of beer includes for cost of hops, brewing, bottling, distribution etc. so the average cost of the barley in a pint is probably less than 5p. Even if the price of barley doubled it would only add 5p to the cost of a pint, between 1 and 2% in the average pub. How people got paid to write such an obviously flawed scientific paper is beyond me. How Joe thinks that repeating whatever you’re told without any checking of facts is journalism is also beyond me. Journalism has changed so that now it involves no research and no fact-checking. Some of it is down to cost cutting and the rest is probably ignorance and incompetence. A clue to how the economic model might be wrong is to look at Ireland. Their beer taxes are slightly higher than in Britain being €22.55 per hectoliter per cent of alochol in the beer. For the 5% alcohol, that works out (in GBP) at 98p a liter for 5% and 78p a liter for 4% beer. But in Ireland the authors are forecasting a bottle of beer could rise by 43% to 338% per bottle. He’s getting a hammering in the comments and likes/dislikes! The DM has clearly gone to the dark side, but I was cheered recently by a piece on BBC R4 about cider making in England. It was a rare blast from the past, no black/Asian presenter, no EU workers, nothing about climate change or sustainability, no sermon about organic farming or chemicals, no Brexit fear-mongering, and even a joke when the female was called a “smart bird”. I expect the BBC complaints department is now snowed under. The catastropharians like to say the same about wine too. I just give them a link to the French winery in tropical Rangiroa, which gets two vintages a year. O/T – the CH4 news coverage of the released fracking protesters was disgraceful, even worse than the BBC usual standard! I’d type more detail but I might smash up my keyboard. Yes I saw that, a doubling of the term of imprisonment would have been more appropriate. I can only assume that the “learned” Judge is of the green fraternity and of course very able to pay the ridiculous energy costs of his mansion, or owns a wind farm! No, he is probably making money by having a biomass boiler heating his house, swimming pool, and barns and making money from spending £100 and getting £160 back. I wonder if they would protest if the drilling was to bury “carbon” at great depths? How much more mickey mouse can they get? The researchers are as ignorant in economic theory as they are in costing. In a market-based economy those first in the queue are those who are able to pay more. To feed a cow you need quite a lot of feed, so small increases might make quite a lot of difference to demand, as substitutes are available. The quantity of barley per liter is relatively small. The cost of malting barley is current £214 a tonne. Assuming 250g-300g of barley per liter that is 5-7p a liter. The cheapest nastiest 5% lager is currently about £1.50 a liter. Joe Public says £0.94 of that is duty. He forgets the VAT on the duty, so a shop would have to charge £1.13 a litre to give the stuff away. But the premium branded beers in the supermarket are over £2.00 even on the multi multipack can offers, and in a pub £4-£8 a liter. So even if the price of barley went up ten times it would rise the premium beers (even with some mark-up) by much less than 50%. Cattle can eat the spent grains of the brewing process. At Beck’s in Bremen I watched tractors pulling up with trailers to take away the spent grains from a chute. But with AGW Greenland will be able to grow barley as they did 1,000 years ago. Anthropogenic ‘Climate Change™’ as reported is ‘small beer’ compared to the might of nature. Hey we are an adaptable species! Less beer for our dollar/pound maybe, but would more affordable tequila be such a bad thing? The Scientific American puts this in issue in better context. The doubling of beer prices is in the worst case scenario a 17% decrease in crop yields due to a 4.8 Celsius increase in temperatures this century. Even the discredited RCP8.5 has 4.5 Celsius increase since 1850, or maybe 3.8 Celsius this century. This will cause a massive rise in prices over the next 80 years with no adaptation. It’ll most certainly double in price if we take the ‘Norway’ option when leaving the EU. Now the scare mongerers are getting serious: all the sophisticated stuff about corals and far away countries submerging and ice free summer arctic are not going to bother the people in the street. “Who cares?” they say, ” Warmer sounds good, we like sunshine, bring it on”. So if you want to seriously scare the masses in the temperate world tell them their lager is at serious risk – that will get the pulses racing and the mob into the streets. All that is needed now is invent some story about global warming shutting down social networks and civil war will start the following day. Risible fairystory but then, I noticed this guff on mail online t’other day, i looked at the byline and saw ‘Joe Pinkstone’ titled – is it moonbat havin’ a larf? Sorry but it’s just not a real name, and then the article – you realize it, know it: it’s just going to be pure penned cow droppings. Amazing how credible, serious journalists like Rose are being sidelined with impunity. It’s clearly part of the Left’s concerted strategy to close down every sceptical voice, wherever they find them. BBC – jumped in years ago by accepting ‘the science is settled and the debate is over’. BBC – Banned sceptics like Lord Lawson on the flimsiest of grounds. BBC – Now insisting man made AGW is an absolute and irrefutable fact. Guardian – Relentless propaganda and have annihilated BTL sceptical comments. Indy’ – Rabid alarmism, no reader BTL comments worth reading. This tactic of no-platforming views of the wrong sort is a genuine disgrace but unfortunately is clearly successful. Hard not to be when the decision-makers hold editorial powers. We live in very disconcerting times. It’s even worse, the Engineering journals all have editorial policies that prevent any “denier” being published. The Internet is the only hope for sanity: fortunately, it is replacing the printed page and so-far has not been controlled by the Green Blob….. .. no doubt they are working on this! The BBC and ITV News outpourings are now even worse than CNN and Sky…… quite an achievement! Yes, we are heading down the road of the old Soviet Union with the Socialist Conservative Party, and we will be there when Corbyn gets in. Make the most of this blog as it will be shut down under Corbyn, along with Breibart. 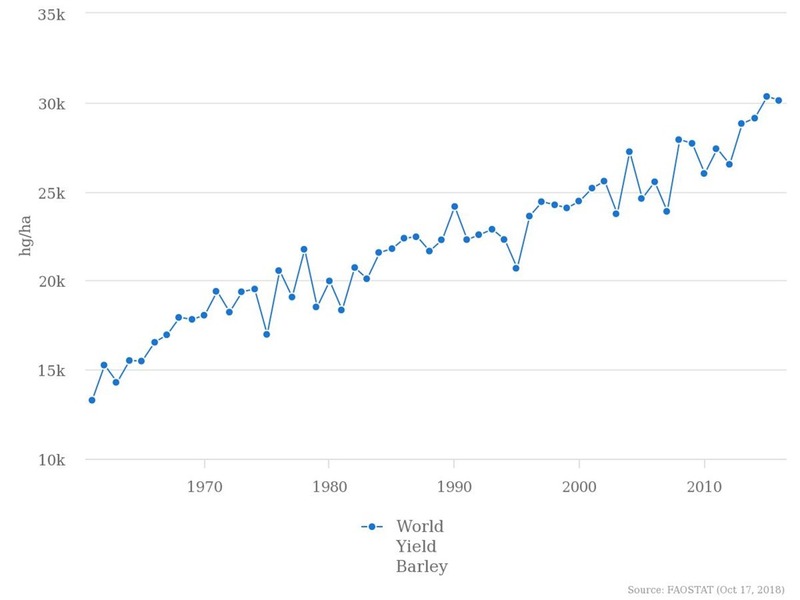 Figure 2 has world maps for “average barley yield shocks during extreme events”. There are maps for each of 4 scenarios with coloured dots for each gridcell growing barley. The growing area are extensive. All across Europe from Southern Scotland to Southern Spain. In Southern Finland and Northern Morroco barley is grown. Eastern Bolivia (the bit North of Paraguay) is most concentrated area of the world with >50% decreases in projected yields. Buy in the very south of the country, just 500-1000km distance there is a North-South strip with less than 5% change either way. It looks like this includes the city of Tarija. Looks like they have incorrectly modeled the 1981-2010 period then exaggerated any trends over a period three times as long and with maybe 6 times the warming. Meanwhile in Alberta, we are finally having some nice weather for harvesting. I read it was the coldest September in over 100 years. Fact check? Farming success is dependent on the weather from the time the farmer plants the seed until until the crop is harvested. A good crop all summer can be ruined in minutes by a hail storm. Since we had snow and cold for the last month it might mean that the crops are of an inferior quality. Your life can be ruined, not just your crops! I had a friend who lived in a rural part of Alberta as a child in the 1940s. His school was two miles away from his home. One winter day, while the air temperature was above freezing, the children were sent home at noon, because a cold wave was forecast. He did not wait for his father to pick him up, but started to walk home. By the time he had gone a mile, it was 42 F below zero! Luckily, his father found him before he was dead. During the Medieval Warming, England grew better grapes and thus had better wine than did France. That peeved France to no end. Then along came the Little Ice Age. England grew barley, etc and took up beer drinking. France refused to change their eating habits and thus many starved. It is said that it is the reason the United States is more a beer-drinking culture than wine. Most early immigrants were from England and Germany. Maybe you can rival France once again with wine and the French will be peeved to no end once again. All of you out there are far cleverer and better informed than me, so can you tell me how we can ensure that all these moronic scribblers, like Joe Pinkstone et al, get to see not only Our Fearless Leader’s observations, but also the stream of informative Comments that follow. Surely, when they can see how utterly ignorant are their blatherings, they might actually start to think and research ? And the same info should somehow get to their editors, in case they care !